A boutique-style resort, Cocobay Unawatuna features a beachfront restaurant, an outdoor pool and aqua gym. Offering access to 200 metres of sandy beach with views of Galle Fort, the resort is located in a fishing village. Cocobay Unawatuna is a 5-minute walk to Unawatuna Bus Station. Galle Railway Station is a 5-minute drive away while Galle Town is 3 km from the resort. It takes approximately 1.5 hours to drive to Bandaranaike International Airport. Furnished with artworks and wood flooring, each air-conditioned room and suite comes with a flat-screen satellite TV, minibar and safe. Private bathroom has a spa bath, rain shower, bathrobes and slippers. Guests can expect a fruit basket upon arrival, pillow menu and free Wi-Fi. Guests can work-out at the gym or take up a yoga course during their stay at Cocobay. A travel counter can offer assistance with planning tours. Airport transfers are also available at an extra cost. 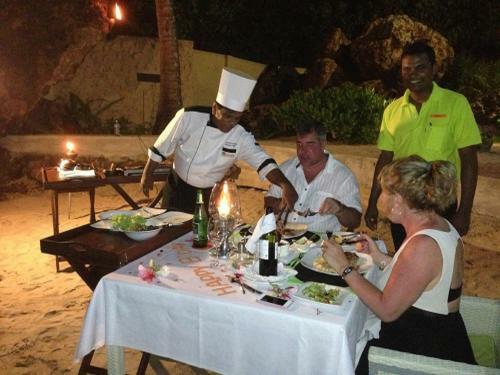 The beachfront La Mer Restaurant serves a delicious variety of Sri Lankan, Chinese and International cuisines. After dinner drinks can be ordered from the Chill Out Lounge Bar. This double room has a bathrobe, satellite TV and minibar. Pokud rezervaci zrušíte do 14 dní před datem příjezdu, nebude vám účtován žádný poplatek. Pokud rezervaci zrušíte pozdě nebo do hotelu nepřijedete, bude vám účtováno 100 procent z ceny první noci.